On Sale Now! Save 9% on the Cosmos Gifts Rooster in Coop Ceramic Salt and Pepper Shakers Farm Animals Bird 20772 New by Cosmos at Animal Backgrounds. MPN: 20772. Hurry! Limited time offer. Offer valid only while supplies last. 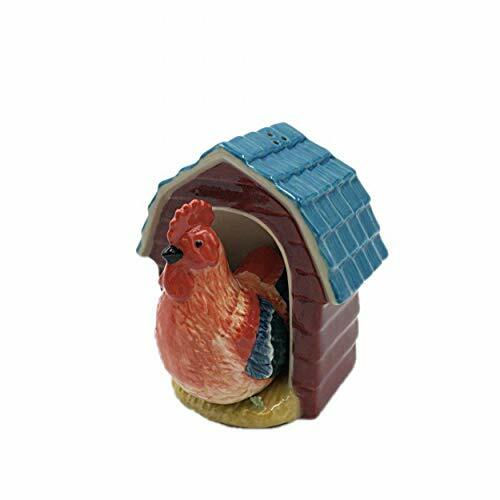 Rooster Coop Salt & Pepper Rooster: 2 1/4'' x 1 3/4'' x 2 7/8''H Coop: 3 1/2'' x 2 5/8'' x 3 7/8''H Enjoy this exquisite item from Cosmos Gifts. Rooster Coop Salt & Pepper Rooster: 2 1/4" x 1 3/4" x 2 7/8"H Coop: 3 1/2" x 2 5/8" x 3 7/8"H Enjoy this exquisite item from Cosmos Gifts. Manufactured with the highest quality fine porcelain and Porcelain , ensuring years of enjoyment.High quality Porcelain construction, hand wash only.